Cattle are one of our major domesticated animals, a higher mammal with complex mental and physical needs. The benefit of a knowledge of cattle behaviour means veterinarians and stockpeople can recognise abnormal behaviour signs for disease diagnosis and indication of an inadequate environment. This book replaces the book Cattle Behaviour, written by the same author and published by Farming Press in 1993. 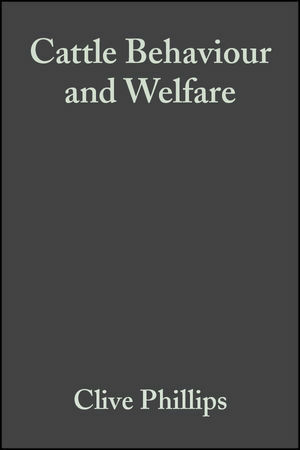 The text has been revised and updated and four new chapters on cattle welfare have been added. The main interest of many reading a book on behaviour is its relation to the welfare of the species, so the combination of welfare and behaviour is a logical one. Clive Phillips is the author of Cattle Behaviour and Welfare, 2nd Edition, published by Wiley. 1. Introduction to Cattle Welfare. 2. The Welfare of Dairy Cows. 3. The Welfare of Beef Cattle and Draft Oxen. 4. The Welfare of Calves. 5. The Welfare of Cattle During Transport, Marketing and Slaughter. 6. Environmental Perception and Cognition. 7. Acquisition of Behaviour and the Use of Selective Breeding to Improve Welfare. 14. Behavioural Adaptation to Inadequate Environments. 15. The Relationship Between Cattle and Man. * draws together a wide range of research findings from all over the world and presents them concisely and readably.